We visited this wonderful old city previously. Our favorite campground, Anastasia State Park, was full. Compass RV resort gave us a nice quiet tree shaded site. As a bonus, they have shuttle service to the hop on hop off trolley in town. We rode the full loop for a quick reintroduction to America’s oldest European city. In 1565, the Spanish built a fort here. Its purpose was to protect Spanish ships returning home from South America. The sailing ships rode the Gulf Stream north and east, coming very close to the Florida coast. They built a wooden fort which was later replaced with the imposing masonry Castillo de San Marcos. This is a picture from the upper battlements looking over the inner courtyard toward the ocean. The Castillo is a National Monument. The Castillo is built of coquina stone which was quarried on Anastasia island. 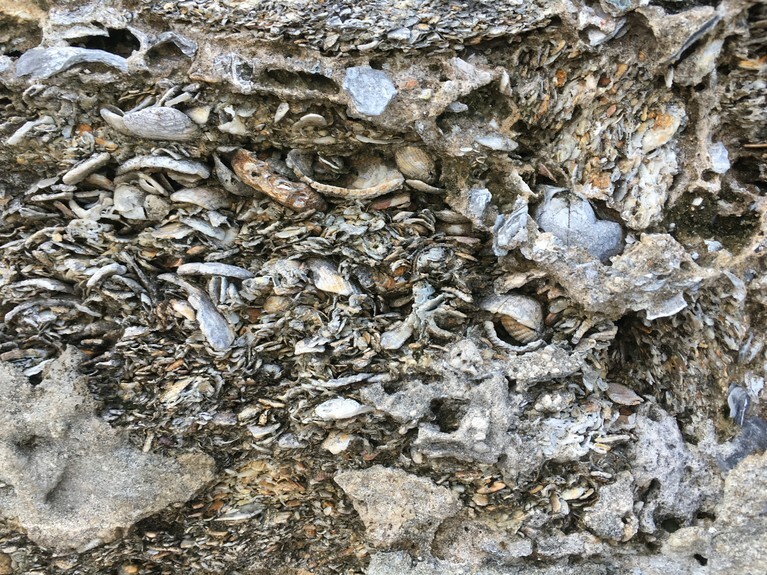 Coquina is a lightweight porous limestone heavily imbedded with seashells. The photo below is a closeup of one of the walls. They were originally covered with plaster inside and out to prevent water infiltration. Coquina was the only permanent building material available, but it turned out to be very advantageous for the fort. Cannon balls hitting the walls were absorbed into the surface and caused very little damage. 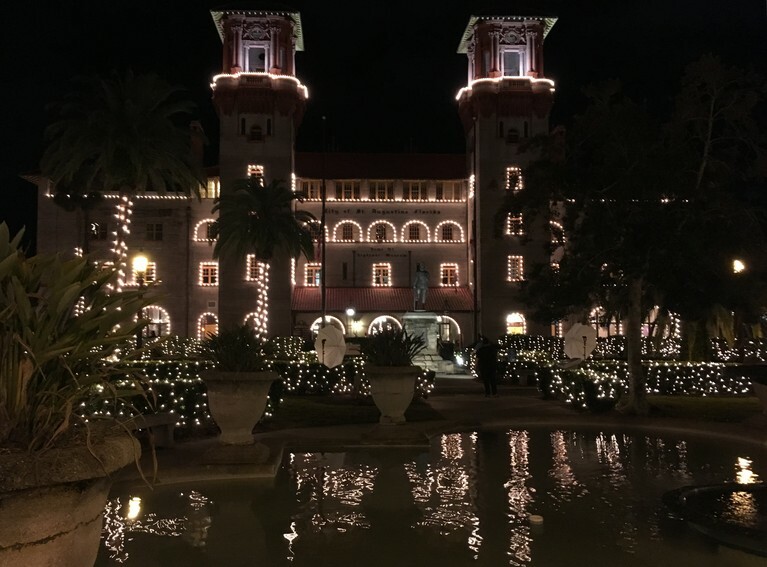 St. Augustine has a holiday light display. The central plaza and the public buildings were beautifully lit with thousands of white bulbs. Many of the local businesses also hung white lights. 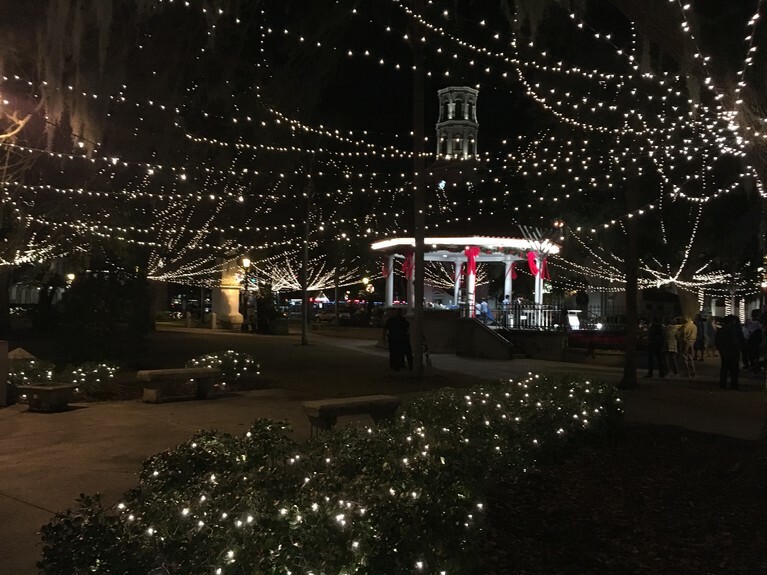 The city says this is a reminder of the Spanish tradition of placing lighted candles in the windows at Christmas. The display is a popular tourist attraction, listed in National Geographic as one of the 10 best holiday light displays in the US. Hope all is warm and wonderful in Cali! Happy 2019! 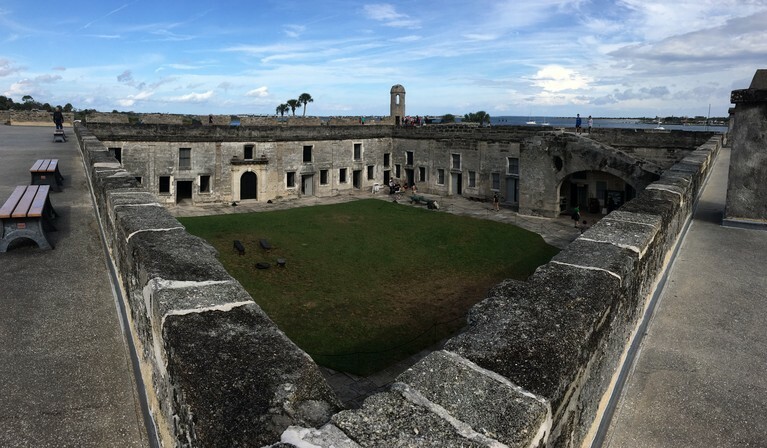 I enjoyed this blog about St. Augustine and especially Castillo San Marcos. I am fairly certain Mom brought us there on our trip to Florida in 1980. Don and I were 14 and Dot was 16. We stayed with Mom’s friend Flo Rossi and that was our home base for day trips to Cape Canaveral, St. Augustine, and Ormond Beach. As you know, Mom took ample leeway with the term “day trip” and often these ran well into the night! I was really interested to learn fro you blog that the coquina walls would absorb the canon balls. It looks so fragile!